As part of our continuous review of the benefits we provide to our colleagues and retirees, Pfizer is making a change in the way we fund prescription drug benefits offered to Medicare-eligible retirees and their Medicare-eligible dependents, effective Jan. 1, 2016. Most importantly, if you are affected by this change, your prescription drug coinsurance percentage and per prescription minimum and maximum will NOT change in 2016. What is changing is that the retiree prescription drug plan for Medicare-eligible participants will move to a Pfizer-sponsored Medicare Part D prescription drug plan through SilverScript® Insurance Company which is affiliated with CVS/caremark, Pfizer’s current pharmacy benefit manager. This change will have no effect on your medical coverage. The plan, called SilverScript (Employer PDP) sponsored by Pfizer (hereinafter referred to as “SilverScript”), combines a standard Medicare Part D plan with additional prescription drug coverage provided by Pfizer. Part D is Medicare’s prescription drug coverage. Your level of coverage today will not change, including 100% coverage for Pfizer and Greenstone generic drugs. Pfizer is committed to providing its Medicare-eligible retirees with options for accessible, high quality and affordable retiree health care. This change to a Medicare Part D plan through SilverScript is the continuation of the transition that began this year with the change in medical coverage to a Pfizer-sponsored Medicare Advantage plan through United Healthcare (UHC). Currently, Pfizer participates in the federal government’s Retiree Drug Subsidy Program. Through this program, Pfizer receives a payment from the federal government to help offset the cost of providing prescription drug coverage to Medicare-eligible retirees and their Medicare-eligible dependents. However, the value of this subsidy has been declining in recent years, increasing Pfizer’s costs to provide prescription drug benefits. With SilverScript, Pfizer can take advantage of more favorable government subsidies and benefits available with an employer-provided group Medicare Part D plan while providing you with the same coverage. This lower cost will make Pfizer-sponsored retiree medical coverage more sustainable and will enable Pfizer to better manage the increasing costs of providing prescription drug benefits. This change will not necessarily mean lower contributions for you. Your current prescription drug plan design helps to keep your out-of-pocket costs low through features such as 100% coverage for Pfizer drugs, a low per prescription maximum for non-Pfizer drugs and an overall annual out-of-pocket maximum. The Pfizer coverage will continue to have no coinsurance difference between non-Pfizer drugs and their generic equivalents and no prior authorization or step therapy requirements. This change does not affect your Pfizer medical coverage, including the Pfizer-sponsored Medicare Advantage options through UHC. This change affects only Medicare-eligible retirees and their Medicare-eligible dependents. Anyone who is not eligible for Medicare will not be affected by this change. Your prescription drug benefit in 2016 will have the same coinsurance percentage and per prescription minimum and maximum as it does today, with the same annual out-of-pocket maximum. You will continue to receive Pfizer and Greenstone drugs at no cost. You may have read or heard about the Medicare Part D “donut hole,” a gap in Medicare Part D coverage which increases costs to participants when they reach a certain level in total drug costs. This plan does not include a donut hole so your costs will be consistent throughout the year. You will pay the same coinsurance percentage for all non-Pfizer drugs until you meet your annual out-of-pocket maximum, just like you do today. Moving to a Pfizer-sponsored Medicare Part D plan does mean that you will experience some administrative changes, and higher-income retirees will be required by federal law to pay an additional Medicare Part D premium to Social Security. Similar to your Medicare Advantage plan, Medicare Part D is an individual benefit. If both you and your spouse are eligible for Medicare, you each will get your own materials in the mail from SilverScript. You will have a Medicare Part D premium deducted from your Social Security check only if Medicare determines that you are a high income participant (in 2015, income over $85,000 for an individual or over $170,000 for a married couple filing their taxes jointly). For 2015, this Medicare Part D premium ranges from $12.30 to $70.80 per month per individual. 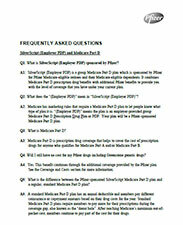 Please refer to the enclosed Frequently Asked Questions (FAQs) for more information. Starting late this summer, you will receive more detailed information about this change. If you have any questions now, please call the Pfizer Benefits Center at 1-877-208-0950. Representatives are available to assist you Monday through Friday from 8:30 a.m. to midnight, Eastern Time.